On account of recurrent invasion and devastation by the iconoclast’s ancient Biraja or modern jajpur was completely destroyed. Hence few inscriptions are met with here and there out of the heap of ruins. However five surviving inscriptions were found in the temple complex of Goddess Biraja. 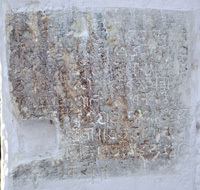 An inscription is set to the temple belonging to the time of the Ganga emperor Choḍagangadev (12th century AD) the inscription speaks of the offering of lamps to the Goddess Biraja during his visit to the Biraja temple. The second inscription is set to the upper lintel of the lion’s Gate of the temple, it belongs to the 19th century AD and the script is Odia. A monk named Bhikari Das had constructed the compound wall of the temple collecting funds from the generous public long after the present temple was reconstructed. He had installed the inscription describing the event with date and year. 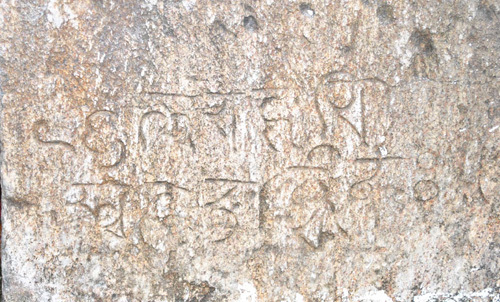 The third inscription is found inscribed under the pedestal of a “Herostone” kept in front of the Jagamohan. The inscription has not yet been deciphered. A fragmentary small inscription is found set to the compound wall to the left of the lion’s gate which has not yet been deciphered. Above two inscriptions belong to the 8th -9th century AD. Another fragmentary inscription is set to the compound wall inside the temple to the south west corner behind the Bhuṣaṇḍesvara temple. It has not yet been deciphered but belongs to the 12th -13th century AD.